Deluxe Ski Jump will celebrate its 10th anniversary on July 4th, 2009. As part of the celebration we will arrange a DSJ 10th Anniversary Online Tournament with special prizes! 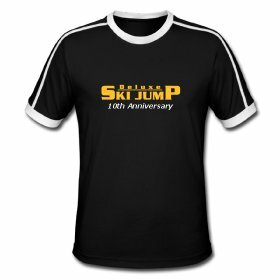 The top ten players will be awarded with a Deluxe Ski Jump 10th Anniversary T-shirt. Last edited by Jussi Koskela on 02 Jun 2009, 15:27, edited 1 time in total. Anyways cant wait for the tournament , i bet its gonna be as big as the tour de dsj . Superb!!!! 10 top get a T-shirt? Last edited by Krzysztof Stuchlik on 03 Jun 2009, 13:32, edited 1 time in total. That T-shirt looks great to be honest. Don't expect to be able to compete for it though - or ... maybe I'm lucky and the majority of the great jumpers have summer holidays ? I could have been at the top !! Last edited by Chabiker on 24 Feb 2011, 16:37, edited 1 time in total. I think simply with Jan, 60 players max. Its not winter, Krzychu. Yes, and additionally, it'll be holiday. This is nice tournament, because now players who aren't just TOP3-players, can get prizes. I'm going to jump that shirt. I think it's possible especially when there shouldn't be so much jumpers now in summer.